‘IN Florence, a rich and famous city of Italy, in the province called Tuscany, there dwelt two rich and principal gentlemen called Anselmo and Lothario, which two were so great friends, as they were named for excellency, and by antonomasia, by all those that knew them, the Two Friends. They were both bachelors, and much of one age and manners; all which was of force to make them answer one another with reciprocal amity. True it is that Anselmo was somewhat more inclined to amorous dalliance than Lothario, who was altogether addicted to hunting. But when occasion exacted it, Anselmo would omit his own pleasures, to satisfy his friend’s; and Lothario likewise his, to please Anselmo. And by this means both their will were so correspondent, as no clock could be better ordered that were their desires. Anselmo being at last deeply enamoured of a principal and beautiful young lady of the same city, called Camilla, being so worthily descended, and she herself of such merit therewithal, as he resolved (by the consent of his friend Lothario, without whom he did nothing) to demand her of her parents for wife; and did put his purpose in execution; and Lothario himself was the messenger, and concluded the matter so to his friend’s satisfaction, as he was shortly after put in possession of his desires; and Camilla so contented to have gotten Anselmo, as she ceased not render Heaven and Lothario thanks, by whose means she had obtained so great a match. The first days, as all marriage days are wont to be merry, Lothario frequented, according to the custom, his friend Anselmo’s house, endeavouring to honour, feast, and recreate him all the ways he might possibly. But after the nuptials were finished, and the concourse of strangers, visitations, and congratulations somewhat ceased, Lothario also began to be somewhat more slack that he wonted in going to Anselmo his house, deeming it (as it is reason that all discreet men should) not so convenient to visit or haunt so often the house of his friend after marriage as he would, had he still remained a bachelor. For although true amity neither should nor ought to admit the least suspicion, yet notwithstanding a married man’s honour is so delicate and tender a thing, as it seems it may be sometimes impaired, even by very brethren; and how much more by friends? Anselmo noted the remission of Lothario, and did grievously complain thereof, saying that, if he had wist by marriage he should thus be deprived of his dear conversation, he would never have married; and that since through the uniform correspondency of them both being free, they had deserved the sweet title of the Two Friends, that he should not now permit (because he would be noted circumspect without any other occasion) that so famous and pleasing a name should be lost; and therefore he requested him (if it were lawful to use such a term between them two) to return and be master of his house, and come and go as he had done before his marriage, assuring him that his spouse Camilla had no other pleasure and will, than that which himself pleased she should have; and that she, after having known how great was both their friendships, was not a little amazed to see him become so strange. ‘To all these and many other reasons alleged by Anselmo, to persuade Lothario to frequent his house, he answered with so great prudence, discretion, and wariness, as Anselmo remained satisfied of his friend’s good intention herein; and they made an agreement between them two, that Lothario should dine at his house twice a week, and the holy days besides. And although this agreement had passed between them, yet Lothario purposed to do that only which he should find most expedient for his friend’s honour, whose reputation he tendered much more dearly than he did his own; and was wont to say very discreetly, that the married man, unto whom Heaven had given a beautiful wife, ought to have as much heed of his friends which he brought to his house, as he should of the women friends that visited his wife; for that which is not done nor agreed upon in the church or market, nor in public feasts or stations (being places that a man cannot lawfully hinder his wife from frequenting sometimes at least) are ofttimes facilitated and contrived in a friend’s or kinswoman’s house, whom perhaps we never suspected. Anselmo on the other side affirmed, that therefore married men ought every one of them to have some friend who might advertise them of the faults escaped in their manner of proceeding; for it befalls many times, that through the great love which the husband bears to his wife, either he doth not take notice, or else he doth not advertise her, because he would not offend her to do or omit to do certain things, the doing or omitting whereof might turn to his honour or obloquy; to which things, being advertised by his friend, he might easily apply some remedy. But where might a man find a friend so discreet, loyal, and trusty as Anselmo demands? I know not truly, if not Lothario: for he it was that with all solicitude and care regarded the honour of his friend; and therefore endeavoured to clip and diminish the number of the days promised, lest he should give occasion to the idle vulgar, or to the eyes of vagabonds and malicious men to judge any sinister thing, viewing so rich, comely, nobel, and qualified a young man as he was, to have so free access into the house of a woman so beautiful as Camilla. For though his virtues and modest carriage were sufficiently able to set a bridle to any malignant tongue, yet notwithstanding he would not have his credit, nor that of his friends, called into any question; and therefore would spend most of the days that he had agreed to visit his friend, in other places and exercises; yet feigning excuses so plausible, as his friend admitted them for every reasonable. And thus the time passed on in challenges of unkindness of the one side, and lawful excuses of the other. ‘Lothario stood suspended at Anselmo’s speech, as one that could not imagine to what so prolix a prevention and preamble tended; and although he revolved and imagined sundry things in his mind which he deemed might afflict his friend, yet did he ever shoot wide from the mark which in truth it was; and that he might quickly escape that agony, wherein the suspension held him, said that his friend did notable injury to their amity, in searching out wreathings and ambages in the discovery of his most hidden thoughts to him, seeing he might assure himself certainly, either to receive counsels of him how to entertain, or else remedy and means how to accomplish them. ‘“It is very true,” answered Anselmo, “and with that confidence I let thee to understand, friend Lothario, that the desire which vexeth me is a longing to know whether my wife Camilla be as good and perfect as I do account her, and I cannot wholly rest satisfied of this truth, but by making trial of her, in such sort as it may give manifest argument of the degree of her goodness, as the fire doth show the value of gold; for I am of opinion, O friend, that a woman is of no more worth or virtue than that which is in her, after she hath been solicited; and that she alone is strong who cannot be bowed by the promised, gifts, tears, and continual importunities of importunate lovers. For what thanks is it,” quoth he, “for a woman to be good, if nobody say or teach her ill? What wonder that she be retired and timorous, if no occasion be ministered to her of dissolution, and chiefly she that knows she hath a husband ready to kill her for the least argument of lightness? So that she which is only good for fear or want of occasion, will I never hold in that estimation, that I would the other solicited and pursued, who notwithstanding, comes away crowned with the victory. And therefore, being moved as well by these reasons as by many other which I could tell you, which accredit and fortify mine opinion, I desire that my wife Camilla do also pass through the pikes of those proofs and difficulties, and purify and refine herself in the fire of being requested, solicited, and pursued, and that by one whose worths and valour may deserve acceptance in her opinion; and if she bear away the palm of the victory, as I believe she will, I shall account my fortune matchless, and may brag that my desires are in their height, and will say that a strong woman hath fallen to my lot, of whom the wise man saith, ‘Who shall find her?’ And when it shall succeed contrary to mine expectation, I shall, with the pleasure that I will conceive to see how rightly it jumps with mine opinion, bear very indifferent[ly] the grief which in all reason this so costly a trial must stir in me. And presupposing that nothing which thou shalt say to me shall be available to hinder my design, or dissuade me from putting my purpose in execution, I would have thyself, dear friend Lothario, to provide thee to be the instrument that shall labour this work of my liking, and I will give thee opportunity enough to perform the same, without omitting anything that may further thee in the solicitation of an honest, noble, wary, retired, and passionless woman. ‘“I am pleased,” quoth Anselmo; “say what thou likest.” And Lothario prosecuted his speech in this manner: “Methinks, Anselmo, that thou art now of the Moors’ humours, which can be no means be made to understand the error of their sect, neither by citations of the Holy Scripture, nor by reasons which consist in speculations of the understanding, or that are founded in the Articles of the Faith, but must be won by palpable examples, and those easy, intelligible, demonstrative, and doubtless, by mathematical demonstrations, which cannot be denied. Even as when we say, ‘If from two equal parts we take away two parts equal, the parts that remain are also equal.’ And when they cannot understand this, as in truth they do not, we must demonstrate it to them with our hands, and lay it before their eyes, and yet for all this nought can avail to win them in the end to give credit to the verities of our religion; which very terms and manner of proceeding I must use with thee, by reason that the desire which is sprung in thee doth so wander and stray from all that which bears the shadow only of reason, as I doubt much that I shall spend my time in vain, which I shall bestow, to make thee understand thine own simplicity, for I will give it no other name at this present; and, in good earnest, I was almost persuaded to leave thee in thine humour, in punishment of thine inordinate and unreasonable desire, but that the love which I bear towards thee doth not consent I use to thee such rigour, or leave thee in so manifest a danger of thine own perdition. And, that thou mayst clearly see it, tell me, Anselmo, hast not thou said unto me, that I must solicit one that stands upon her reputation; persuade an honest woman; make proffers to one that is not passionate or engaged; and serve a discreet woman? Yes, thou hast said all this. Well, then, if thou knowest already that thou hast a retired, honest, unpassionate, and prudent wife, what seekest thou more? And, if thou thinkest that she will rest victorious, after all mine assaults, as doubtless she will, what better titles wouldst thou after bestow upon her, than those she possesseth already? Either it proceeds, because thou dost not think of her as thou sayst, or else because thou knowest not what thou demandest. If thou dost not account her such as thou praisest her, to what end wouldst thou prove her? But rather, as an evil person, use her as thou likest best. But, if she be as good as thou believest, it were an impertinent thing to make trial of truth itself. For, after it is made, yet it will still rest only with the same reputation it had before. Wherefore, it is a concluding reason, that, to attempt things, whence rather harm may after result unto us than good, is the part of rash and discourseless brains; and principally when they deal with those things whereunto they are not compelled or driven, and that they see even afar off, how the attempting the like is manifest folly. Difficult things are undertaken for God, or the world, or both. Those that are done for God are the works of the saints, endeavouring to lead angels’ lives, in frail and mortal bodies. Those of the world are the travels and toils of such as cross such immense seas, travel through so adverse regions, and converse with so many nations, to acquire that which we call the goods of fortune. And the things acted for God and the world together are the worthy exploits of resolute and valorous martial men, which scarce perceive so great a breach in the adversary wall, as the cannon bullet is wont to make; when, leaving all fear apart, without making any discourse, or taking notice of the manifest danger that threatens them, borne away, by the wings of desire and honour, to serve God, their nation and prince, do throw themselves boldly into the throat of a thousand menacing deaths which expect them. Himself because he had offended so. So that thou canst not excuse thy grief with secrecy, be it never so great, but rather shall have continual occasion to weep, if not watery tears from thine eyes, at least tears of blood from thy heart, such as that simple doctor wept, of whom our poet makes mention, who made trial of the vessel, which the prudent Reynaldos, upon maturer discourse, refused to deal withal. And, although it be but a poetical fiction, yet doth it contain many hidden morals, worthy to be noted, understood, and imitated; how much more, seeing that by what I mean to say now, I hope thou shalt begin to conceive the great error which thou wouldest wittingly commit. 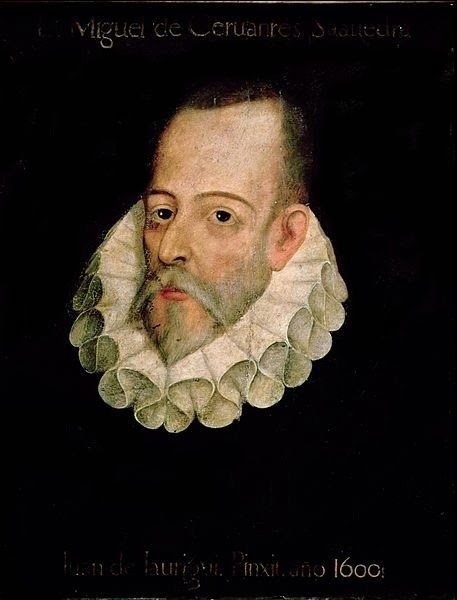 ‘“Tell me, Anselmo, if Heaven or thy fortunes had made thee lord and lawful possessor of a most precious diamond, of whose goodness and quality all the lapidaries that had viewed the same would rest satisfied, and that all of them would jointly and uniformly affirm that it arrived in quality, goodness, and fineness to all that to which the nature of such a stone might extend itself, and that thou thyself didst believe the same without witting anything to the contrary; would it be just that thou shouldest take an humour to set that diamond between an anvil and a hammer, and to try there by very force of blows whether it be so hard and so fine as they say? And further: when thou didst put thy design in execution, put the case that the stone made resistance to thy foolish trial, yet wouldest thou add thereby no new value or esteem to it. And if it did break, as it might befall, were not then all lost? Yes, certainly, and that leaving the owner, in all men’s opinion, for a very poor ignorant person. Then, friend Anselmo, make account that Camilla is a most precious diamond as well in thine as in other men’s estimation; and it is no reason to put her in contingent danger of breaking, seeing that, although she remain in her integrity, she cannot mount to more worth than she hath at the present; and if she faltered, or did not resist, consider even at this present what state you would be in then, and how justly thou mightest then complain of thyself for being cause of her perdition and thine own. See how there is no jewel in the world comparable to the modest and chaste woman, and that all women’s honour consists in the good opinion that’s had of them; and seeing that of thy spouse is so great, as it arrives to that sum of perfection which thou knowest, why wouldest thou call this verity in question? Know, friend, that a woman is an imperfect creature, and should therefore have nothing cast in her way to make her stumble and fall, but rather to clear and do all encumbrances away out of it, to the end she may without impeachment run with a swift course to obtain the perfection she wants, which only consists in being virtuous. Seeing all might come to pass. That to soldier is so queasy. ‘“All that which I have said to thee, Anselmo, until this instant, hath been for that which may touch thyself; and it is now high time that somewhat be heard concerning me. And if by chance I shall be somewhat prolix, I pray thee to pardon me; for the labyrinth wherein thou hast entered, and out of which thou wouldest have me to free thee, requires no less. Thou holdest me to be thy friend, and yet goest about to despoil me of mine honour, being a thing contrary to all amity; and dost not only pretend this, but dost likewise endeavor that I should rob thee of the same. That thou wouldest deprive me of mine is evident; for when Camilla shall perceive that I solicit her as thou demandest, it is certain that she will esteem of me as of one quite devoid of wit and discretion, seeing I intend and do a thing so repugnant to that which the being that him I am, and thine amity do bind me unto. That thou wouldest have me rob thee thereof is as manifest, for Camilla, seeing me thus to court her, must imagine that I have noted some lightness in her which lent me boldness thus to discover unto her my depraved desires, and she holding herself to be thereby injured and dishonoured, her disgrace must also concern thee as a principal part of her. And hence springs that which is commonly said, That the husband of the adulterous wife, although he know nothing of her lewdness, nor hath given any occasion to her to do what she ought not, nor was able any way to hinder by diligence, care, or other means, his disgrace, yet is entitled with a vituperous name, and is in a manner beheld by those that know his wife’s malice with the eyes of contempt; whereas they should indeed regard him rather with those of compassion, seeing that he falls into that misfortune not so much through his own default, as through the light fantasy of his wicked consort. But I will show thee the reason why a bad woman’s husband is justly dishonoured and contemned, although he be ignorant and guiltless thereof, and cannot prevent, nor hath given to any occasion. And be not grieved to hear me, seeing the benefit of the discourse shall redound unto thyself.